Merry Christmas Eve all my crafty friends. I can’t wait for Christmas morning, how about you? Today I have another Christmas card for you and this one is actually my favorite out of all the Christmas cards I made this year. This beautiful card was made for my sister (I hope she likes it) and for the 2 Crafty Girls Challenge Blog. 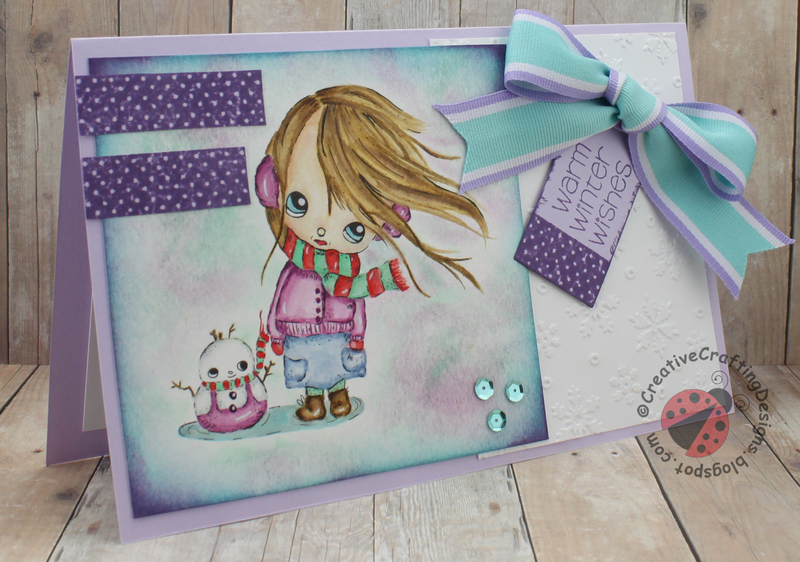 To create this stunning card I used the digi stamp Winter Walk by Ppinky Dolls and painted it with Tim Holtz Distress Inks. Isn’t she just adorable? The card base is light purple Recollections cardstock and was cut with my Cricut Explore. I love cutting my card bases on my Cricut because I can get a perfect straight cut and it scores the center for me, so I’m able to get a perfect center fold with ease. I used white Recollections cardstock and the Darice Snowflakes embossing folder with my Sizzix BIGkick to create the snowflake mat. To create the tag I cut it with my BIGkick using a QuicKutz Nesting Tag Cookie Cutter Die. 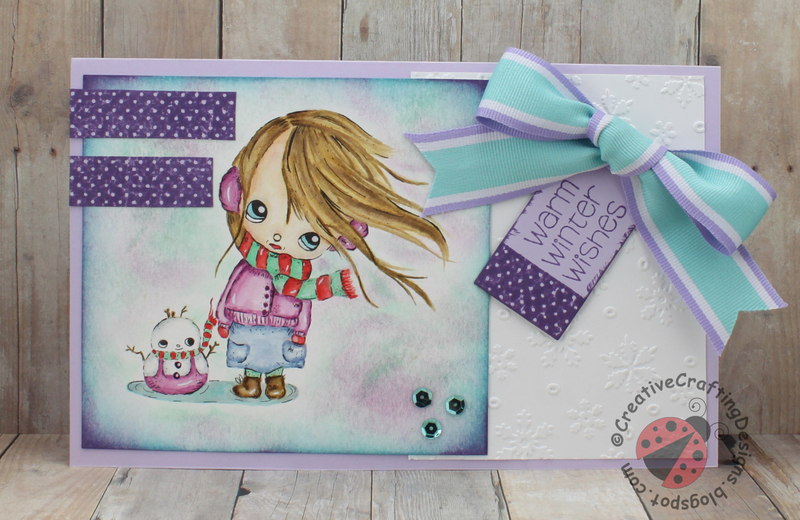 I then added the sentiment “Warm Winter Wishes” using the stamp set Winter Wishes by Jaded Blossom. Now, the purple polka dotted washi tape actually isn’t washi tape, I used a polka dotted washi tape stamp by Jaded Blossom from the stamp set Designer Tapes I love this stamp set, it’s perfect for adding those last minute touches to your creations especially because you can ink them in what ever color you want to match your design. They have more sets of this style of stamp which is top on my wish list. To finish up this beautiful card I added a big purple, blue and white striped ribbon from my craft stash and some blue sequins to the corner of my painted image (sequins used is from the Craft Medley Rhythm N Blues set). I do have to say, I’ve really come to love the big bows on the cards, they are so easy to do and give the cards the “aww, it’s so cute” look. *Note: If you would like more details on how I painted this image with Tim Holtz Distress Inks, hop on over to my “A Snowy Night Christmas Card” post. 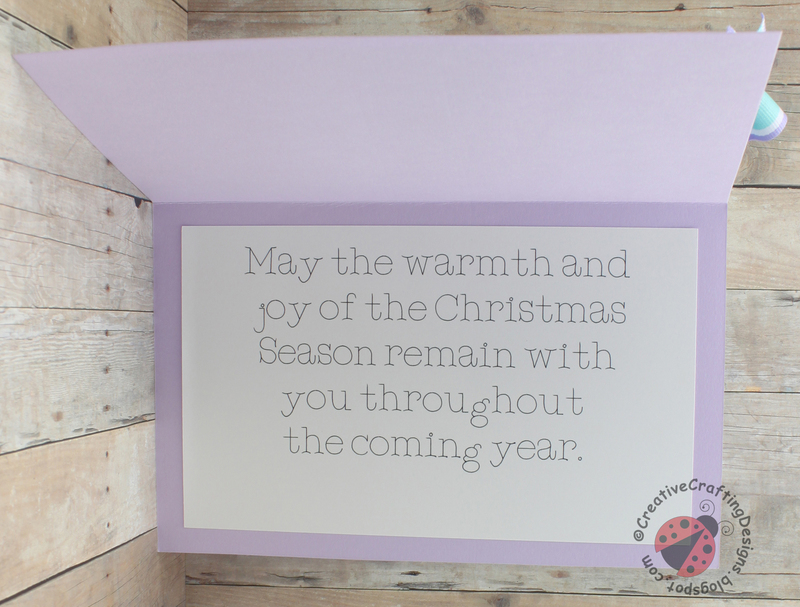 I used my Cricut Explore to write the sentiment “May the warmth and joy of the Christmas Season remain with you throughout the coming year”. I used the font Cricut Alphabet in the has a writing style setting using a black Pilot Precise V5 black pen (this pens fit perfectly into the pen housing on the Cricut Explore). Thank you so much for stopping by my blog today, I hope you enjoyed my post. Make sure to hop on over to the 2 Crafty Girls Challenge Blog and check out the Winter Blues Challenge.